Bo Rambler with a child fan during the DePaul v. Loyola game on January 21, 1989. LU Wolf, Loyola's mascot, entertains the crowd during a Loyola Basketball game, 1995. 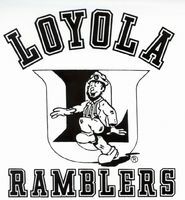 Bo Rambler, a short-lived mascot who started leading the cheers for the Loyola basketball team in 1982.